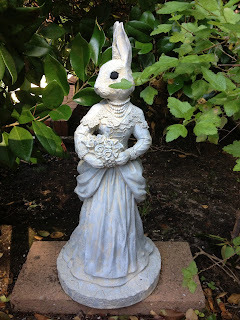 My aunt's garden in San Francisco is filled with wonderful garden statuary! She must have hundreds of these statues hidden amongst all the wonderful plants and flowers. I loved this one the best because it is so unusual! My aunt is always puttering about in her garden weeding or watering or pruning. Her garden is a labor of love indeed. I had such a wonderful trip. Where to begin? The day I arrived I had dinner at my cousins house in San Mateo. He is a a wonderful chef and we had such a lovely dinner. I was too hungry and tired to take pictures of the food so you'll just have to believe me. He owns a food import/export business and gets really high quality food. He made us lamb kebabs on the grill which I am still drooling over. They were that good! On my first full day we visited the Filoli Estate in Woodside CA. It was once someone's home and now it is open to the public. Grand indeed and the gardens were to die for. On Friday my aunt gave me the cooks tour of the California Academy of Sciences where she is a docent. An amazing center combining research as well as a science museum. (Did I mention she is in her 80's and drives a sports car?) She is my Auntie Mame! She never stops moving. After that we visited the De Young Museum to see the Diebenkorn exhibit. Not to be missed it is a wonderful retrospective of his years living in Berkeley. Saturday we went to the movies and saw The Butler. A good movie. Sunday we saw a live revue in town called Beach Blanket Babylon. Hilarious show. Some of the people in line that we spoke with (everyone is very friendly out there) had seen it multiple times! Monday we shopped and I swam in her pool. Tuesday, my final day we visited the Asian Art Museum to see Larry Ellison's Japanese screen collection. Ah the things billions can buy! Lovely show though! After that we visited the Palace of the Legion of Honor museum to see the Impressionists on the Water show in honor of the Americas Cup Race taking place there this month.. The best thing about it was the view of the bay and San Francisco from the high hill. Stunning. I really had a wonderful time. It was great traveling alone for a change. I have to do that more. I have many new ideas for work now. That happens sometimes when you see new things. Wow, what a fantastic trip, your aunt sounds like an amazing lady, so much fun! I haven't been in San Fran in about 25 years but I long to go again, such a beautiful place. Sounds like you were immersed in culture, too fun, and inspiring.